Gounod’s opera Faust is full of really memorable tunes, especially for the chorus. One of the most delightfully exuberant comes towards the end of Act II – ‘Ainsi que la brisé légère’. It has a lightness and consistent propulsion that captures the spirit of the words, which describe waltzing as a light breeze raising dust from fields. The first verse describes being drawn into the waltz and making the countryside resound with singing. In a second verse, the words are of dancing till out of breath, until carried away as the earth dizzily spins round. The final lines are: ‘Quel bruit! Quelle joie dans tous les yeux!’ – What a noise, what happiness in everyone’s eyes! By the middle of the 19th century, Europe whirled to the waltz. For people with two legs and a left/right two-time rhythm, the effect of three beats in a bar proved intoxicating. It invited a sense of perpetual motion through the momentum of turning as you dance. And with this came associations of liveliness, levity and even lasciviousness – you need to hold your partner very close! The waltz was the dance of hedonistic enjoyment. So when Gounod uses a waltz to introduce the celebrating crowds in Act II of Faust, he signals through his musical setting their complete happiness. Gounod uses more than the three-beats-in-the-bar regularity of the waltz rhythm and the steady oom-pah-pah accompaniment. While the first part of the waltz begins with repeated notes in a middle register, the second section picks out a high note at the beginning of each phrase (echoed in the orchestration straight after). This creates that sense of lift, as though the tune just can’t be kept down. Using the waltz as a social dance that evokes a sensation of group abandonment to pleasure recurs in operas and operettas. For example, Puccini uses it in La rondine with a series of waltz sections that sweep through Bullier’s dance hall, where Act II is set. But it works for solo moments too. One of the highlights of Gounod’s Faust is the Jewel Song for Marguerite. 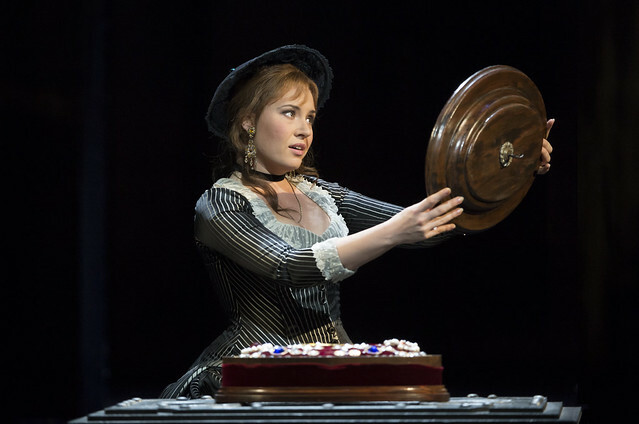 She discovers a box of wonderful jewels, conjured up by Méfistofélès to help Faust seduce her. As she opens the box, then tries out how she would look in diamonds and pearls, she sings an aria famous for its coloratura (fast and delicate high notes). Here is the same musical creation of breathless excitement, the racing heart. It shows itself in the main tune, which begins with a run up to one little high note – a thrill of delight – followed by a phrase of incredulous delight, and continues through successive rising phrases. Gounod recognized a good bit of musical characterization and used exactly the same technique in his opera Roméo et Juliette. In the first act, Juliette declares she has no intention of marrying and settling down to some domestic restraint. Instead, 'Je veux vivre' – she wants to live! She sings about this in a gloriously catchy coloratura waltz song that is sister to Marguerite’s Jewel Song. The little gasping effect is now the breathless enthusiasm of Juliet as the song starts – her will to indulge in life’s experiences is already in the audience’s mind contrasted with the knowledge of how doomed a desire this is. And of course, in Faust, we also know that Marguerite’s happiness too will be short-lived. But while that waltz song plays, we forget the future and just give in to the moment and that delightful, invigorating, seemingly endless whirl. Faust runs until 25 April 2014. Tickets are still available. Faust is a co-production with Opéra de Monte Carlo, Opéra de Lille and Fondazione Teatro Lirico Giuseppe Verdi, Trieste, and is given with generous philanthropic support from David Hancock, Spindrift Al Swaidi, Martin and Jane Houston, Mr and Mrs Christopher W.T. Johnston, The Tsukanov Family Foundation, The Connoisseurs’ Series and The Friends of Covent Garden. I can't wait to see/hear the DVD of the current Faust with Calleja, Terfel and the new Margurite! Me too, looking so much forward to to see/hear the DVD of Faust with Calleja, Terfel and the new Margurite! There will be a DVD? We will not be releasing the current run on DVD. Why won't you release a DVD of the current Faust? I have the 2004 one and was so looking forward to seeing the new one with Terfel and Calleja. Please, please. Unfortunately, there are a number of reasons why we're limited in the number of productions we're able to film, cost being one. This means that we haven't been able to film this revival. Sorry to hear that you're disappointed. Just finished listening to the wonderful simulcast in Cambridge, Mass. Thank you to the fantastic cast, to ROH, thank you technology!